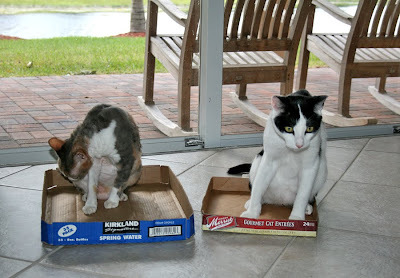 Hmmm, let's see here.... my box is not as LONG as Daisy's. I think I got the WORSE box! Harley, Daisy is the senior CEO (Cat Executive Officer), and you are a junior officer, so you will just have to settle for the smaller box for now. You got the REDDEST box! Remember Harley ~ the biggest isn't necessarily the best. Sometimes the cutest things come in the smaller packages! We remember the veterans wiv pride. Yes, Daisy got the biggest box. But she is the oldest. I think Daisy should give you the bigger box since you are the bigger cat. I'm sure a smart cat like you will figure a way. Sorry, sweet Harley. Daisy kinda has you with both rules... age and beauty! Your only hope is sweetness. Try some of that on Daisy. Just don't hold your breaths. Nah, your box is purrfect for you, Harley!! Harley, you did get the smaller box. What is the deal?? But at least you got a box. Take care. Harley, all boxes are good! Your box is just snugglier! Hmmmm...you might be right, Harley. Your box does look like it would be snug and cozy if you curl up in it...that can be a plus. I like what Sparkle said, I would not have thought of that very just argument! Bravo Sparkle. Harley - you won't need to spend as much time tidying up as Daisy will. this is the funniest post! just cracked me up today! But Harley...your box had the tasty goodness in it! Happy Veterans Day to you all, too! I'm sure she will swap with you!! Jst ask nice. Harley, we think you look purrfect in your box! Sam loves boxes!!! This is lol funny. and I did! Thanks I needed that. Harley, just remember good things come in small packages! Happy Veterans Day, Miss Daisy and Mr. Harley! It is kind of funny that the bigger cat got the smaller box... but it maybe more fitting that the senior member of your ranks got the bigger box! It's not the size that counts. At least that's what the ones with smaller boxes say. harley, sometimes a box is just a box. don't worry about it! we likes you just fine, no matter which one you haff. no no no Harley it isn't the worse box, just tell yourself it seems smaller cuz yous is just a bigger cat sitting in the same size box. That will help convince yous your box is just as good as Daisy's. Ah Harley, but yours is much cozier. Indeed, Harley, you are bigger than Daisy you have the bigger box. Fair is Fair. Oh Harley, it isn't the worse box, just the smaller one. See if you can curl up real small and fit into it! Harley we think your box is great - it isn't the worse box. It is just a different box. Plus sometimes the smaller boxes are funner to play in! You know Harley, size is not always the determining factor in all things! Boxes are not sized according to occupant at your house are they? Harley, sometimes smaller is more cozy :) You look good in your box ! Purrs to all the Veterans!! Harley, it is not the worst box, it is just the smaller box. Happy Veterans Day! both boxes look good to me!! Hmmm.... yes... Daisy's box is bigger than yours Harley! Sometimes smaller boxes are more snuggly Harley! Well, you did get the smaller box but is it really the worst? Harley, I LOVE little boxes. The smash factor is AWESOME! Love, Tiny Johnson, the 20 pound tabby. Ah, yes, the old "BBS". Sadly "Box By Seniority" is an old established tradion established by older senior kitties. The boxes may not be equal, but they do have equally wonderful kitties in them!! Harley, biggest isn't always best. Boxes are the best!! We can see you two are enjoying yours!! We'll maybe Harley has Box envy!! Smaller box is more snug, Harley!!! Oh...in boxes, long as there's no 'hangover' it's just the right size!